Not all Olympian athletes will be heading to South Korea this week. Specifically, those from Olympia, Wash., will be staying home. 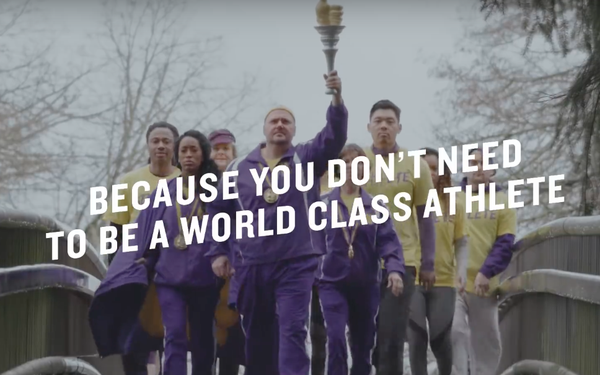 Planet Fitness, which is decidedly not a sponsor of the 2018 Winter Olympics or Team USA, is celebrating athletes of all stripes in a new campaign that celebrates the people who work out at their facilities in Washington’s state capital. The spot launched Monday on the brand’s web page as well as on its social media channels, and will be supported with paid posts and public relations efforts. The company is also selling shirts like those worn by the athletes in the video, “so that anyone can join Team PF,” Medeiros says.